Kalady is a village near Angamali, located east of the Periyar river, in the Ernakulam district of Kerala. It is the birthplace of Sri Adi Shankara, and a must visit destination for the Hindus. Kalady started featuring in the spiritual map of India only after its rediscovery in the late 19th century by the then Shankaracharya of Sringeri and the subsequent consecration of a temple for Sri Adi Shankara in 1910. Legend holds that one day, Aryamba the widowed mother of Little Shankara, fainted after walking three kilometers for her daily bath in the Poorna river now known as Periyar.Feeling helpless, Little Shankara prayed to Lord Krishna. The tears of the child moved Krishna, who blessed him thus: "the river will flow where your little feet marks” . It is said that Shankar then marked a place in the soil with his big toe and the Periyaar river took its new course in the place marked by Shankara. That place came to be called Kalady. The Periyaar river began flowing through Little Shankara's home garden. Shankara then installed Lord Krishna into the present temple, and marked the occasion by reciting Ätchutha Ashtakam. Shankara's shrine at Kalady, maintained by the Sringeri Mutt, is situated on the northern bank of the river Periyar. The samadhi of Sri Shankara's mother, Aryamba, is located here. There is a small shrine to Lord Ganesha where Shankara used to pray daily. There are also two major shrines in the temple which were built later, one is dedicated to Sri Shankaracharya and the other to Goddess Saradamba, the main deity of Sringeri. The pooja rituals in these temples are done by Tamil or Kannada Smartha Brahmins, and not by Namboothiris as is the custom in Kerala. The pooja rituals in this temple are conducted by Namboothiris as is the custom of Kerala, unlike in the Shankara mutt where they are done by Tamil or Kannada Smartha Brahmins. There are three ghats ( ‘kadavu’ in Malayalam and ‘padithurai’ in Tamil) to the left of the SriKrishna temple. The two significant ghats are the Kalady ghat and the Crocodile ghat. 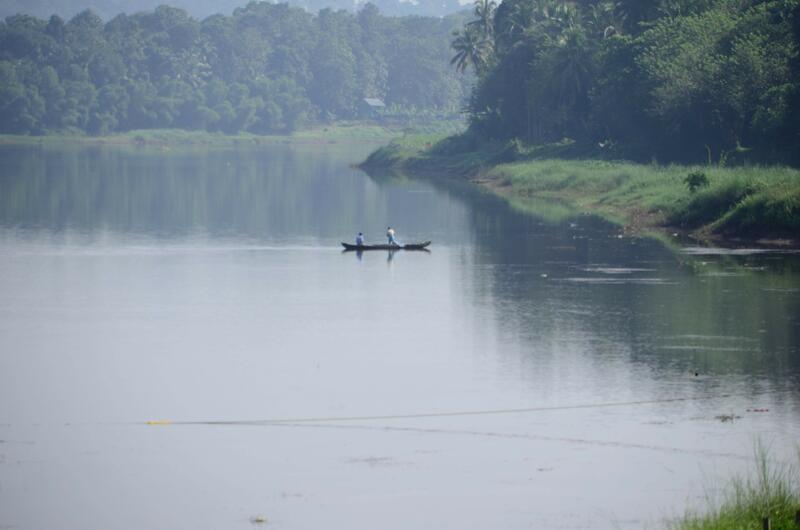 The Kalady Kadavu is the place where the river took its turn, and where Kalady was born. It was also the place where Shankara had first performed Aaraattu (a river bath of an idol) for his ancestral deity Sri Krishna before installing it at its current location. During the festival at Sri Krishna Temple, the Aarattu has been carried out at this ghat even today. The Crocodile Ghat or "Muthala Kadavu," is where Shankara's life turned to Sanyasam. His mother, Aryamba, did not agree with his desire to become a Sanyasi. Legend says that one day, Shankara was touched by a dog and, as per custom, Shankara had to take a bath. Accompanied by his mother, Shankara went to the river Poorna to bathe. While in the river, a crocodile caught hold of his leg. The drowning Shankara told his mother that the crocodile would leave him alone if she would allow him to take up Sanyasam. His helpless mother agreed, and the crocodile then let go off Shankara. How to reach?You can reach Kalady in Kerala by rail, road or airways. Nedumbassery Airport is about 6 km from here and Angamali railway station is situated 10 km away but many express trains many not stop there. Get down at Alwaye and this is well connected. By your car - Assuming that you have reached Alwaye, you can reach Angamally in 20 minutes and it is only another 20 minutes drive from Angamally. Note:If you are hiring an auto beware that you will not get auto from the mutt unless you retain yours. But however it is only a few hundred feet walk to the nearest bus stand to Kalady main BS. Time of visit : 5am to 1pm; and 4pm to 8pm. Where to Stay? There are accommodation available in Kalady ashram itself .I believe that, it has to be booked in advance. Contact Sri Adi Shankara Janmabhoomi Kshetram, Kalady – 683574 Kerala.Ph: 0484 - 2462350 E-mail: sringerikldy@sify.com. My suggestion is to stay at Angamali where you can find good accommodation and reasonably good food .You can take an auto from here to reach the mutt for under Rs 50.